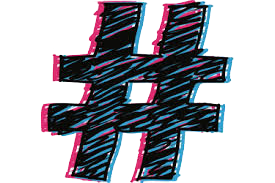 Unless you are in the online tech industry, then you’ve probably got some confusion as to exactly what a hashtag (#) is and how to use it. I’ll teach you the nuts and bolts of what you need to know in this post, but first, check out this quick video. It’s from September of 2013. For those of you #SNL fans (Saturday Night Live) Justin Timberlake is known to stop by and make frequent cameo appearances on the show as he is good friends with many members of the cast, past and present (not to mention Lorne Michaels). So, it’s no surprise that he’d inevitably show up as a guest on Late Night with Jimmy Fallon.